Internet service in businesses and homes is now so commonplace that the general public has a much better understanding of Wi-Fi equipment than they had for the last few decades. If you are ready to branch out buy some of your own equipment, you’re not alone. As technology and products evolve, so will your knowledge. One of the electronic equipment trends in Wi-Fi is managing the internet for all your devices using a modem router combo. The modem picks up the signal from your ISP like Comcast, AT&T, Time Warner Cable, Verizon, or whichever service provider offers the internet in your area. The modem connects to the router. The router has the job of routing the Internet to all your electronic devices. With the help of the best router modem combo, you can watch a TV show while your spouse sits next to you watching Netflix on another device. Your teenage son can be streaming games while our teenage daughter is streaming music. At the same time, any of the family members can be using the internet on a laptop, checking the weather on a tablet, or making a call on a cell phone. There’s enough internet speed to keep everyone happy. With so many uses for Wi-Fi within one household or office, it makes sense to get educated about equipment like the best cable modem router combos and get the best products for your use. There are two main reasons to find the best modem router combo. First, it saves you money. It costs less than buying two pieces of equipment, and it costs less than renting a router from your internet service provider. The second reason is that one unit is just easier to set up and you’ll want to get up and running as quickly as possible. The ARRIS SURFboard SBG6782-AC is one of the top contenders because of its versatility and good value. This device is one of the best modem router combos because it is universally compatible with most major cable providers. This product is approved by most major cable companies, as well. It is a highly compatible device that works with Windows, Mac, Unix, and Linus. ARRIS designed the SBG6782 with DOCSIS 3.0 technology, which is eight times faster than DOCSIS 2.0, which supports internet speeds up to 1800 Mbps. The device has extraordinarily fast throughput by utilizing eight downstream and four upstream channels. Channel bonding give the upstream and downstream channels for the top in transfer speed. Its power is reliable, and there is no interference with lagging or dragging. ARRIS thought about large households with the design of this product. It has two antennas that give synergy to the built-in booster to create a strong signal between your modem router and all of your devices. The signal for the Arris SBG6782 extends throughout large homes, even up and down other floors and around corners. Households that use Wi-Fi extensively won’t find a drain on the system with this SBG6782-AC. Since 1997, ARRIS has made a name for itself with a quality line of electronic devices. They are so certain that this product will work for a long time, they have backed it with a 2-year limited warranty against any malfunctions. If you have any issues with your ARRIS product, or need assistance getting it set up, ARRIS technical support is available to you any time of night or day. Give their technical team a phone call or send off an email and you will get help within a short time. There are a few small issues with this device. One being that it runs warmer than comparable models. The QoS settings aren’t user-friendly, either. Lastly, the device is not supplemented with instructions as thorough as they should be. This unit is white and sleek. It fits into your home so well that you wouldn’t know it was there, except that it works so well. It’s perfect for the busy family that uses multiple devices on a daily basis. NetGear designed this device exclusively as the best modem router for Comcast web service, although it works equally as well with all other major ISPs. With 960 Mbps speeds on the downstream and upstream. With 24 x 8 channel bonding, it has plenty of speed to use multiple devices at a time without slowing down the throughput. Connect your modem router using any or all four Ethernet ports or the USB port and start sharing or streaming media with a secure internet connection. NetGear offers its NeGenie app with this modem router. NetGenie protects your network from harmful viruses and hackers. It also lets you manage your employees’ internet time during working hours with remote access. Whether you enjoy leisurely watching television or browsing the internet for work or play, it gives a reliable signal with good speed and quality. The NetGear Nighthawk AC1900 keeps up with the best of the gamers and proves to be reliable across all types of electronic devices. Advanced users will appreciate the advanced security features and customizable options. The NetGear Nighthawk lets you fully customize your system by allowing you to set up a personal FTP server, guest network access, double firewall protection and DoS attack prevention. You can expect to pay a higher price tag for this modem router, but the extra features of this model make it worth every penny. If you’re into space-saving, this might not be your favorite option. The Nighthawk takes up a little more space than a few other routers in its class. The connectivity range is solid, but nothing to write home about. This one is perfect for the internet user that wants to sleep at night knowing that this modem router is keeping the hackers, bots, and threats at bay. Netgear is a reliable brand, and this design offers the top in speed. When designing this modem router, TP-Link combined a high-performance modem with 802.11AC next generation Wi-Fi to create a powerful and reliable home network. This device gets its high speeds from 4 upstream and 16 downstream channel bonding. The TP-Link Archer CR700 has the utmost in throughput efficiency. It has 450 Mbps upload speed and 4 GHz on the download speed. It also has 1300 Mbps on the 5 GHz band. The unit design has six internal antennas and high-powered amplifiers. These features reduce annoying interference on your modem router combo and give it strong and targeted signal strength. This system almost installs on its own with the easy one-touch WPA wireless security encryption with WPS button. You won’t have any issues setting it up, but if you have any questions, you can call the multi-language technical support team to get answers. The back end of the TP-Link Archer CR700 gives you access to four Ethernet ports and two USB ports so that you can connect multiple other devices and set up your system to share media files between your devices. The technology includes dual core processors to make sure there is no interruption of service when multiple users are processing tasks on the network. This unit lets you set up your FTP server remotely so that you can customize your system. Set up a separate guest network or use different secure Wi-Fi access for an in-home office. You can also manage the bandwidth of individual devices connected to the router with the IP-based bandwidth control feature. One of the downsides is that numerous users reported frequently dropped connections while using this device. Another common complaint was that the customer support (or lack thereof) left a lot to be desired. It has everything you need for a busy household or small office. If you are looking to save on your cable bill and get high-performance, this unit does the job. ARRIS Designed their SBG6580 so that it has three ways to use it. Not only is it a router and modem combined into one, but you can also use it as a Wi-Fi access point. This modem router makes the top ten list because it has great speed and all the versatility you need, even for busier households. The ARRIS SURFboard SBG6580 has a DOCSIS 3.0 modem with eight download and four upload channels that give speeds up to 343 Mbps. It comes with a multi-directional antenna for improved signaling. Comcast Xfinity, Charter, Time Warner, Brighthouse Networks, Cox, Mediacom, and some other regional cable internet providers approved this device for plans up to 100Mbps. Unfortunately, this quality product will not work with some of the major providers like Verizon, AT&T, or Centurylink. The ARRIS SIRFboard SG6580 has four Ethernet ports to give you all the flexibility that you need to connect all of your favorite devices. If there is a downside to this modem router, it’s that it doesn’t work with all internet providers. The unit runs hotter than it should, and the WiFi connection can be spotty. This unit gets kudos for being one of the most secure devices on the market. You’ll have no worries about hackers and spammers with your ARRIS SURFboard SBG6580. It also supports advanced encryption services for data. The parental controls block inappropriate content from children. NetGear designed the N300 for the budget conscious consumer that wants a modem router combo with good speed and connectivity without the higher price tag. 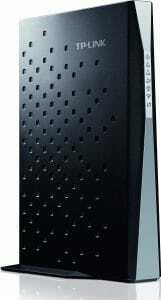 This modem router works in nearly every part of the country because it is optimized to work with all major providers. It only operates on a single band, but with download speeds of up to 340 Mbps, it works well enough for most households. The NetGear N300 has a Turbo-Transfer feature that transfers your data up to 40% faster than previous models, across several devices at the same time. Despite not having all the bells and whistles of other modem router combos, the NetGear N300 delivers solid DOCSIS 3.0 connectivity. Throughput is fast and easy with eight downstream channels. This model only has two Ethernet ports for fast-wired connections and one USB port to share your hard drive across other devices. If this is all the versatility that you need, there’s no cause to invest in a higher-priced modem router combo. Parents love this modem router because it has advanced parental controls. This device gives you the ability to filter out any unwanted websites and other control that is not appropriate for them to see. Consumers also favor the NetGear Genie app, which lets you control and monitor your system remotely. You can even perform minor repairs remotely. The NetGear Genie app is free on Android, PC, Mac, smartphone or tablet, so it’s worthwhile to download it and set it up. One of the downsides is that this router only supports up to 300Mbps throughput. This modem router does the job for most people. It doesn’t max out all the speed and features of some other units, but maybe you don’t need that anyway. If you just need a good performing modem router that gives you the peace of mind in knowing that your children can’t access inappropriate content. This device is on the lower end of the cost spectrum making it a nice value. Zoom Telephonics brought this AC1900 to the market, giving its competitors a run for their money. It has three dual band antennas for the best in speed, range, and reliability. It boasts fast, reliable speed with four upstream and eight downstream channels. This all-in-one modem router gets boosted performance with Broadcom TurboQAM technology that increases speed by 30-50%i more than competitors without it. This device has a 343 Mbps downstream speed and a speed of 123 Mbps downstream. It has two types of beamforming, which gives you expanded wireless range and increased speed. When your Zoom Telephonics connects to any other wireless client, the Broadcom Any Beam connects, making your connection faster and more reliable, even if the smartphone, computer, tablet, smart TV or other Wi-Fi compatible device doesn’t have beamforming technology. You also get four Gigabit Ethernet ports for connecting all of your devices. It sets up quickly and easily with the WPS Wi-Fi pairing button. Zoom Telephonics AC1900 gets credibility with a certification by CableLabs. Comcast XFINITY, Time Warner Cable, Bright House, and other providers certified the AC1900 for use with their sytems. Parents will appreciate the parental controls feature, where they can restrict their children from inappropriate content and streaming. It also has an advanced firewall that keeps out hackers and spam. Unfortunately, the setup process is a bit dated and the overall build quality could be better. This unit will save you money because you won’t have to rent a modem and router from your ISP, which could save you hundreds every year. You get the added benefit of not having to hide unsightly cords and cables because it has the modem and router all in one. Given the awesome features of this model and the mid-range price point, this modem router combo keeps pace with the best of them. NetGear manufactures this modem router for efficiency with a design that includes 16 downstream and 4 upstream channels. It has a lightning fast speed of 1750 Mbps. It has four Ethernet ports to hook up all of your favorite devices and a USB port for sharing files and other data. This product gets its strong range from the six internal antennas and amplifiers that help to strengthen the signal. The dual core processor sends out instructions quickly which boosts your wired and wireless connections. The beam forming technology locates and targets your devices for the best quality of signal. 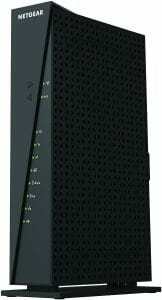 These features make the NetGear AC1750 one of the best cable modem routers available. NetGear’s AC1750 all-in-one modem router is up to speed with thinking green. It has green compliance certificates from CEC and REACH. This model, by NetGear, works with all major providers including Cox, Xfinity, Charter, Brighthouse Networks, Cablevision, Time Warner Cable, Charter, and more. If you’re a space-saver, this might not be your preferred model as it is a bit on the bulky side. What a great modem router for gamers who want to maintain a signal that is fast and reliable. It’s easy to set up, and it won’t take a toll on your energy bill. The NetGear AC1750 falls into the mid-range price bracket, so you get a lot of speed for the money. It may be hard to believe that there are still a few people out there that don’t want or need the top-of-the-line, latest technology modem router combo. Actiontec came to the rescue for those people who have a one or two-person household and only use their internet on occasion. Don’t be fooled by the DSL only capability on this model. It’s a quality product with plenty of features and does the job that the manufacturer set it up to do. Rigorous testing proves that it provides the highest levels of compatibility and performance. For a basic, lower-priced modem router, you get three-in-one technology. It has a full-rate DSL modem, a 4-port switch, and a 300 Mbps wireless N router. 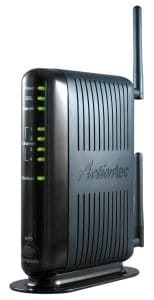 The Actiontec ADSL Modem Router is compatible with all major DSL service providers like Qwest, Verizon, AT&T, and more. It doesn’t work with FIOS, U-verse, Comcast, Cablevision, Infinity, Cox, or Charter. It supports CenturyLink, but not their VDSL. If you are just an occasional web user, you will appreciate the preconfigured simple setup that auto-detects your specific service settings. You’ll also like the strong security features like WPA, WPA2 encryption, and the ability to assign a unique ID to the gateway to stop the hackers. The Actiontec gt784wn ADSL modem router also houses a high-grade firewall with denial of service protection, content filtering, intrusion detection, and additional encryption to ward off unwanted visitors. One of the downsides with this device is that there’s no DCHP address reservation. Quite a few users have also reported the need to constantly reboot. Some people just need a basic modem router that works for things like checking emails and browsing the web once in a while. If that is all you need, there’s no need to spend hundreds of dollars on the latest, greatest technology. This little unit will do just fine. This NetGear modem router combo has everything you need in a modem router combo and much more in the medium-priced range. It has dual-band capabilities, so you get the great speed without annoying lags and interference. It helps that the NetGear c3700 100nas has eight downstream and four upstream channels, which gives you speeds up to 340 Mbps. The speed capabilities of this modem router make it a perfect choice for gamers and streaming videos. The channel bonding on this device gives you fast cable internet speeds, especially during peak hours. The NetGear N600 is certified to work with all most internet service providers like Comcast XFINITY, Time Warner Cable, Cox, Cablevision and others, so it works just about anywhere that you live or work. It has 2 Gigabit Ethernet ports and a USB port for system versatility. This device serves an extended Wi-Fi range that is perfect for covering larger homes. NetGear designed this modem router with the highest level wireless security by including WPA and WPA2. Secure your own system and add a network for guests without compromising your personal network security. The NetGear c3700 100nas modem router is ultra-easy to use, even for a beginner. It sets up easily for iPad, tablets, computers and smart phones. The installation is as easy as pushing the WPS button. You also have the option to power it off whenever you wish using the on/off power button. A couple of downsides to point out. Inexperienced users may find that the DSL setup is a bit difficult, and the throughput isn’t quite as good as their N750 model. When things like high speed and extra security top your list of desired features, the NetGear N600 should be near the top of your list for modem router combo comparisons. With the exception of having only two ports, this modem router has everything you need and more. The price isn’t bad either. The ARRIS SURFboard SBG6400 combo keeps pace with the higher-priced models when it comes to speed and efficiency. This device has an internal processor that gives a top-notch performance for gaming and HD live streaming. The SBG6400 comes with 2 Gigabit Ethernet ports for getting its fast speeds to all your devices. This design embedded the firewall for extra protection against hackers, bots, spammers, and unwanted visitors. This modem router is great for families. The unit has parental controls and works well in larger homes with multiple floors and large square footage. As a bonus, it is compatible with Windows and Mac. The SBG6400 is compatible with most ISPs like Comcast, Time Warner, Cox, and some small regional cable providers. If you’re not a fan of rebooting your device, this might not be your favorite option. Numerous users have reported having to do so far more often than they’d expect. This is another modem router that offers a family friendly experience. For households where Mom is watching TV in the living room, Dad is surfing the internet to catch up with breaking news, their teenage son is in the basement gaming with friends, and their daughter is texting with friends, this modem router can handle it all. With reading the lists of features and functionality, it’s easy to become overwhelmed when looking for the right one for your needs. The first thing you need to decide is what features are most important to you. Do you watch HD TV? Do you have a house full of serious gamers? Does someone in your household use the internet practically every waking hour of the day? The answers to these questions will lead you to the modem router combo that works best for you. The first feature that most manufacturers boast about is the high rate of speed that their product produces. Most of the newer models have more than enough speed for even the busiest of households. The one exception is if you have gamers in the house. Gamers will appreciate having speeds at least in the vicinity of 340 Mbps. You’ll find that more manufacturers are adding four or more Ethernet ports. One USB port used to be the norm, but it’s not uncommon to find modem router combos with two or more USB ports. You need to consider how you want your modem router to function in your home. If you only need one or two ports, there’s not much sense in getting a modem router that has six ports. The only exception is if solid branding and cost make it worth your while. You may find uses for those extra Ethernet and USB ports at a later date. Any manufacturer can come up with a good quality product even if they are not a leader in the market, so don’t overlook a particular model just because of branding. You could be missing out on a great product. If solid industry branding is one of your criteria for comparing, look for industry leaders like NetGear and ARRIS. The reputation for quality within modem routers is strong. You’re likely to want a newer model before it breaks. That’s why the minimum warranty is generally at least one year. The track record for modem routers is strong enough that many manufacturers are offering 2-year warranties. Strong security is a feature that everyone should be looking for, whether you live alone or you have a bustling household of four or more people. If you have regular guests or rent rooms for Airbnb, bed and breakfast, or a vacation rental, you’ll want the best in security. Look for strong firewalls, access to a guest network, and WPA and WPA2. Check to see what kind of support is available if you run into trouble during setup or somewhere down the line. A wordy manual works great if you can understand the technical language. Many consumers prefer to get help within minutes with a quick phone call, or by chatting up a tekkie on an online chat. Cost should never be your first consideration, but it certainly counts when it comes to considering value. When you can get a little more for the same money, it makes sense to take the upgraded version. The good news is that price points don’t vary much at all. On the low end expect to pay between $60-$100. The mid-range spans from $100 to $150. High-end models will cost you $200 or more. This model is a pleasant surprise for being one of the lowest priced models on the market. Actiontec didn’t skip out on quality or features when they designed this product for the consumer that doesn’t need nor want every bell and whistle available. It still uses the DSL technology, but DSL still works very well, so this isn’t an obstacle with this model. The 300 Mbps speed rivals the speed of some of the best gaming modem routers. It can be used three ways—as a modem, a router, or a 4-port switch. The system is highly intuitive and almost sets itself up. The Actiontec Wireless-n ADSL doesn’t get lax about security features. It has a solid firewall to protect your system, and it lets you set the parental controls. If you’re on the fence with this model, it’s worth taking a chance on it. The money that you save by not renting a router from your ISP will easily cover the cost of this unit. Like the Nighthawk bird, who is most active in the late evening and the early mornings, NetGear’s Nighthawk AC1900 has the speed and reliability to support multiple devices around the clock without interruption. With download speeds of up to 960 Mbps, it blasts the others away with its exemplary speed. It has 4 Ethernet ports and a USB port so you can connect all of your favorite devices. The NetGear Nighthawk works well with most internet service providers. You’d expect no less for an industry leader in electronics, like NetGear. I highly recommend getting the NetGenie app. It gives you enhances security, but it also does much more. Use NetGenie to stream video or content to your other devices. You can also print wirelessly from your tablet, phone, or other electronic devices. Expect to find this model in the higher priced product offerings. For avid internet users, this device is well worth the money. The NetGear N300 edges out the ARRIS SURFboard SBG6580 for the best budget modem router combo. Both units have top-notch speeds for gaming, streaming, and HD TV, but the NetGear N300 gives a slightly higher speed. The NetGear N300 works with all main internet service providers, while the Arris SURFboard SBG6580 doesn’t work with AT&T, Centurylink or Verizon. I appreciate that both units have parental controls. In rating the NetGear N300 a bit higher, I took into consideration that it costs slightly less. It also offers you a lifetime limited warranty in comparison with the ARRIS SURFboard SBG6580’s 2-year warranty. Overall, the NetGear N300 edges out ARRIS’ modem router in the area of value. NetGear takes three of four of Editor’s Choice picks with this final selection for the best overall modem router combo. 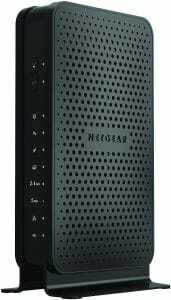 The NetGear AC1750 cable modem router has the coveted dual band technology. The fast 680 Mbps speed gets a boost from the antennas and amplifier. The beamforming technology enhances this device even further. The 4 Ethernet ports give you plenty of flexibility for a customized network setup. The NetGear AC1750 has one of the easiest setups, even for beginners. It’s compatible with almost all major providers so that you can use it pretty much anywhere in the United States. NetGear designed this modem router to be energy efficient and green compliant. These are features that are trending towards being some of the most desirable features of the future. With a mid-range price, the NetGear AC1750 is the top contender in modem router combo devices. You might be wondering if it makes a difference if you select a separate modem and router over a modem router combo. Again, it depends on how you want or need to use your internet network. For most households, a modem router combo works just fine, even if you have high internet usage and do lots of gaming and live streaming. There are a relative few reasons for you to consider setting up your system with a separate router and modem. If you are running a business or offering public high Wi-Fi speeds, it’s typically better to get a router that is separate from the modem. A dedicated router unit generally offers a higher quality of security functions. The other reason to consider a separate modem router is if you are in business for yourself doing web hosting. For this purpose, you want to protect your clients from harmful risks, as well as your own system. You can see that the exceptions are relatively few in comparison with the vast majority of people who use Wi-Fi every day. There are plenty of options for modem router combos for every purpose and budget. The nicest benefit for everyone is that you’ll save money by not renting equipment from your service provider and you won’t have to make room for an extra device or messy cords to hide.